On Memorial Day weekend Kathie and I spent a day visiting the oak savanna restorations at the Necedah National Wildlife Refuge. Over the past decades, the U.S. Fish & Wildlife Service has done extensive work to bring back the oak savannas at this refuge. Among other wildlife, this work has successfully restored habitat for red-headed woodpeckers, a species of declining numbers. We were especially interested in visiting the Necedah savannas because they are quite different in character than those at Pleasant Valley Conservancy. Necedah is in the center of the vast Glacial Lake Wisconsin and is sandy and very flat. 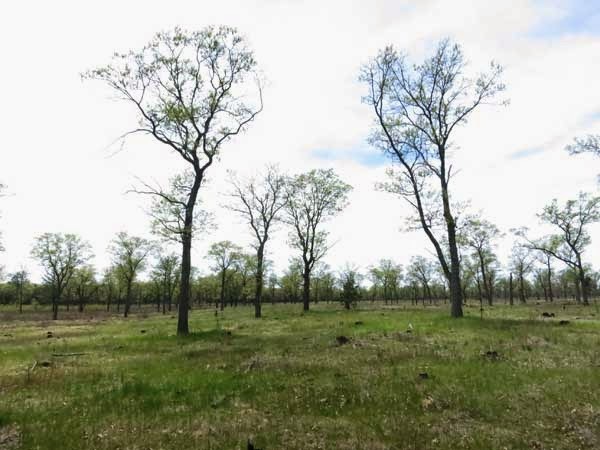 The habitat consists of oak barrens intermixed with extensive oak, pine, and aspen forests, wetlands and open water, grasslands, and rare savannas. Our visit focused on the savannas. The area that we visited contained primarily Hill's oak (Quercus ellipsoidalis), with scattered areas of jack pine (Pinus banksiana). Extensive areas had been restored by selective cutting (Timber Stand Improvement), followed by frequent prescribed burns. Evidence of recent prescribed burns was found. As the photo shows, the canopy is much more open than that at Pleasant Valley Conservancy. Evidence of logging can be seen in the numerous stumps scattered through the site. Red-headed woodpeckers were in evident everywhere in this area. Restored Hill's oak savanna along 12th Road in Necedah Wildlife Refuge. 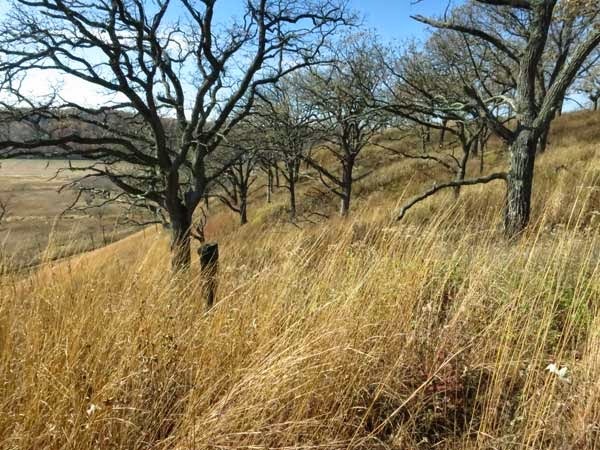 The information on oak savanna in this post is based on the 2004 Necedah Comprehensive Conservation Plan, available for download from this link. Although native, quaking aspen (Populus tremuloides) is completely undesirable in any restored natural area in the Midwest and should be eradicated. Girdling is the only effective procedure and the next few weeks are the ideal time to carry this out. The primary growth of aspen is asexual by underground runners. The typical aspen "grove" is a multi-stemmed clone in which all the roots are interconnected. If an injury to a root occurs, there will be a rapid response by the clone, and new shoots ("suckers") will be sent up all over the area. 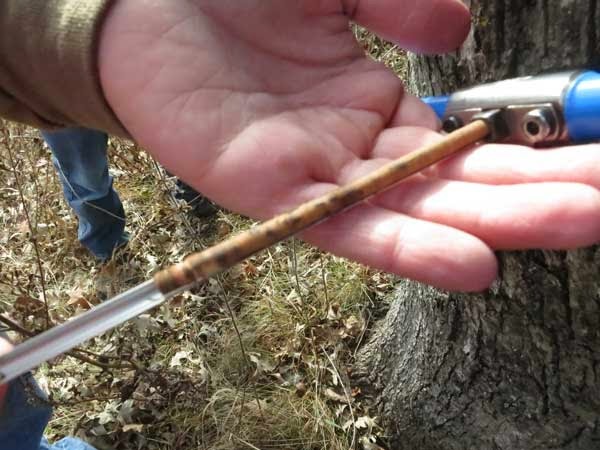 New shoots have been known to arise as far as 50 feet from the nearest aspen tree! The clone may expand simultaneously in several directions, as influenced by environmental conditions. If a single tree or a whole aspen clone is cut, massive numbers of new shoots (called root suckers) will be sent up. An area that had perhaps 5 or 10 large aspen trees will soon have hundreds of small aspen stems. There is only one certain way of killing an aspen clone and this is by girdling. 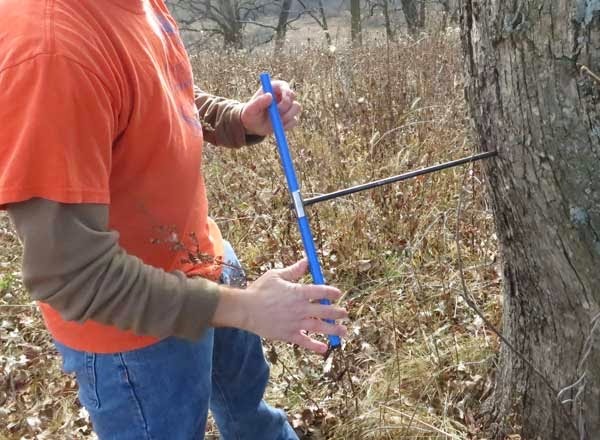 Depending on the size of the tree, different tools can be used in girdling an aspen, but we have found the most effective is a discarded truck spring that is sharpened on one side, which helps in making the initial cut. 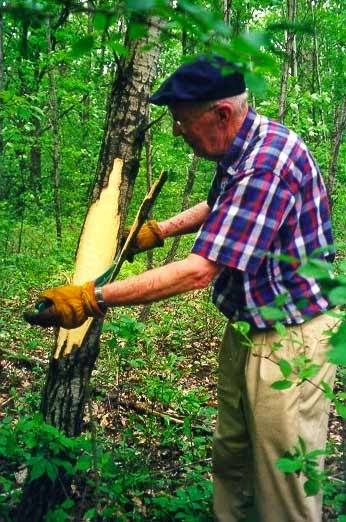 Once the bark is penetrated, it is peeled back all around the trunk, as the photo shows. It is essential that a complete ring is made, otherwise the tree may be able to repair the damage. Also, every tree in the clone must be girdled. See this link for details of the aspen work we have done at Pleasant Valley Conservancy. 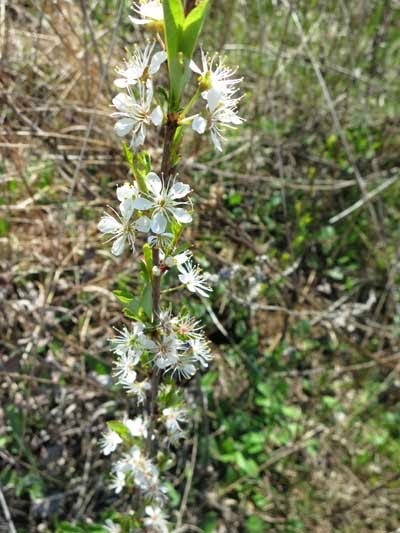 Sand cherry (Prunus pumila) is widespread in Wisconsin but has a high Coefficient of Conservatism (9), an indication of its rather specialized habitat. 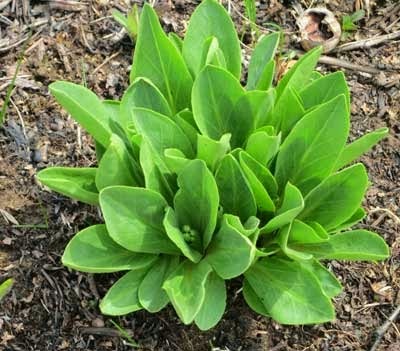 As its common name implies, it is found at sandy habitats such as dunes, sand prairies, barrens, and bracken grasslands (per UW-Madison Herbarium web site). It also occurs on the North Unit at Black Earth Rettenmund Prairie, where it is able to survive frequent fires. Sand cherry was first reported at Rettenmund in the 1950s by Curtis' student Orlin Anderson and has appeared in the numerous species lists that have been made since that time. However, since biennial burns were begun in 2002, we only see it in alternating years, that is, the year that the North Unit is not burned. In those years, the stems make attractive flowers which are easy to spot. It is probably also present in the burn years, but only as short, nonflowering shoots which are not very visible. According to the U.S.F.S. Fire Effects web site, sand cherry grows primarily as a short sprawling rhizomatous shrub. It is widespread in habitats with significant fire history. Both the stems and shallow-depth rhizomes are top-killed by fire, but deeper rhizomes survive, and serve to reestablish the plant. Since this is an off-year for North Unit burns, sand cherry can be easily seen along the trail to the top of the knoll. Look for the attractive white flowers on short woody stems. May is the season for may-apples (Podophyllum peltatum), and clones are now popping up all over the place. According to Curtis and others, this is a species which is found primarily in forests, occasionally also in closed savannas. It is a classic "spring ephemeral", completing its life cycle in early spring before leaves fully develop and the canopy becomes closed. It was interesting to me that this "forest" species can also be found occasionally in prairies. The photo here was taken in the South Unit of Black Earth Rettenmund Prairie. How do we explain its ability to grow there? The explanation is encompassed in the history of the site. The area where this small clone is present was originally prairie but had become invaded by honeysuckle in the early 1960s. Restoration of this area did not occur until about 40 years later. Presumably during the years of "neglect" may-apple became established under the shade of the honeysuckle. How many years will this small clone hold on? Or will it even expand, or eventually be replaced by conventional prairie plants? According to my experience at Pleasant Valley Conservancy, such clones may remain, or even expand, for at least 16 years. How old are our bur oaks? Upon viewing the oak savanna landscape at Pleasant Valley Conservancy it is natural to wonder about the ages of the trees. Many of the oaks, especially the burs, appear to be ancient. They have survived a lot of history and have still managed to keep alive and grow. This bur oak savanna at the top of the ridge has been burned annually for the past 10 years. Some of these trees were cored for the climage/age study. 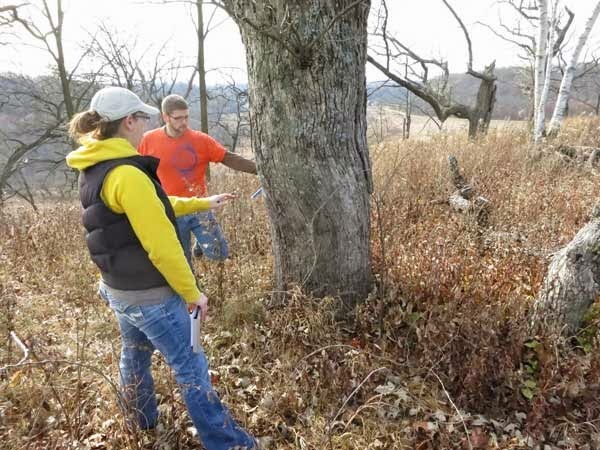 Fortunately for us, a U.W.-Platteville research associate Sara Allen and students under Professor Evan Larson were looking for old bur oaks for a project related to climate change. Our Conservancy was especially suitable because each tree has been tagged and has been mapped by GIS. Last year in mid November Allen and student assistants came and took cores from 10 large bur oaks and 2 large white oaks. Recently they shared the results with us. In the laboratory the cores are mounted for precise analysis of the tree rings. The oldest bur oak had a start date of 1735 for a current age of 279. The other trees sampled were 274, 267, 258, 238, 237, 226, 208, 184, and 169 years old. It is fascinating to consider that the oldest trees began life during the rein of King George II. One tree (238 years old) started life during the time of the Revolutionary War (1776). It is interesting to note that there was no correlation between the diameter of a tree and its age. This is understandable because growth conditions vary markedly from one site to another. Two white oaks were also cored. Although their diameters were similar to those of the bur oaks (28-29.5 inches), their ages were much younger (129 and 145 years). Obviously, with species to species and site to site variability in growth rates, there is no possibility of estimated an age of a tree from its diameter! Pennsylvania sedge (Carex pensylvanica) is a widespread sedge in Wisconsin wooded areas. 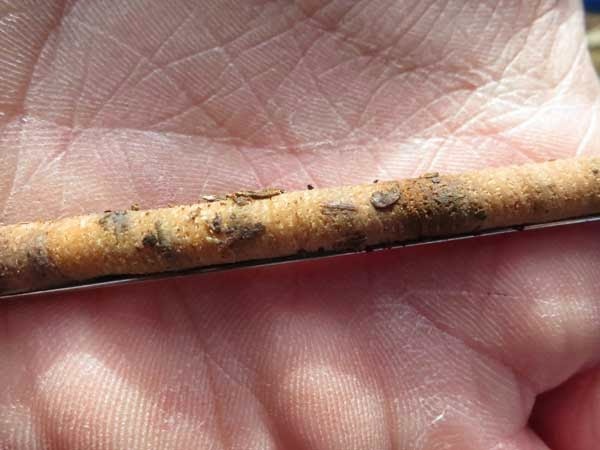 It spreads primarily by rhizome growth and can make fairly large mats in favorable areas. At Pleasant Valley Conservancy we find it most common in the less open savannas, where canopy cover is greater than 50%. The photo here was taken in an area of well established bur oaks (Unit 11B). Originally the area shown in this photo was a large infestation of buckthorn. Once that was cleared, brambles (primarily red raspberry) came in. 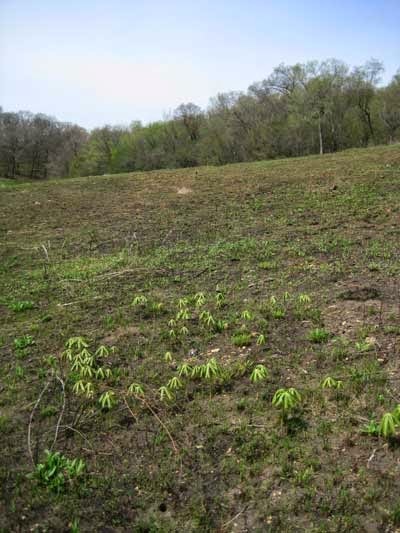 The brambles were then eliminated by persistent use of herbicides, and it is in some of these areas that Penn sedge has now become well established. Fortunately, Penn sedge is a "good" plant. The areas where Penn sedge is established have been subject to annual burns, which seem not to caused any suppression. 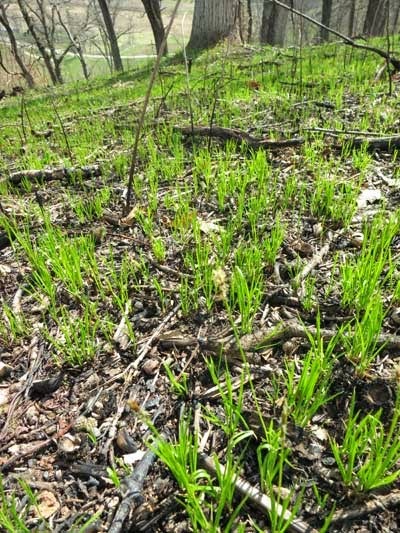 Now is the best time to see Penn sedge, as it is one of the earliest spring flowering plants in the woods. However, its flowers are fairly uncommon since most of its growth is via rhizomes. Later in the season, a number of more substantial flowering plants become established in these areas and the sedge is less obvious. 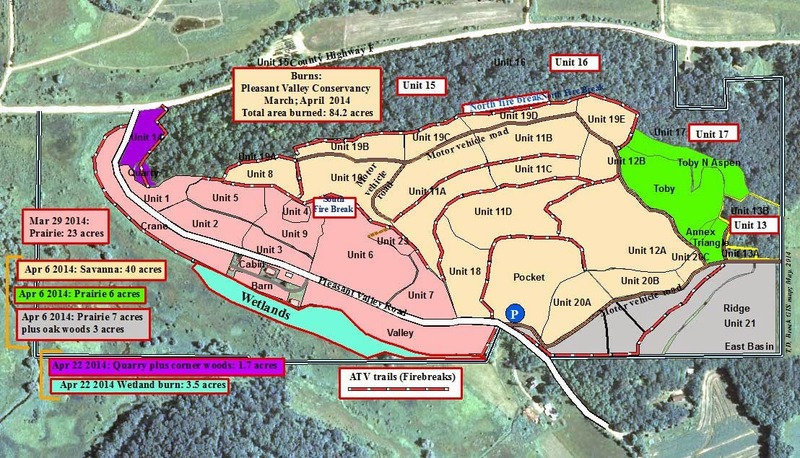 The map below provides the details. We continue to follow the Matt Zine philosophy of trying to do large burns. This means that when the weather is right and the crew is available, burn, burn, burn! The local crew (Amanda, Susan, and Kathie) arrive early to get equipment, water supply, and drip torches ready. The main crew arrives at 10 AM, and at least some crew members commit to remaining at the end of the day for mop-up (especially important for savanna burns). Lighting begins around 11 AM. Since all the burns are being done at one site, no time is wasted on transportation. Once the first burn is finished, the second can begin (except for a brief lunch break). This worked out especially well on April 6, when we did three separate major burns. Of course, some burns are more difficult to do than others, and this needs to be taken into account when organizing. This year due to the weather the two major burns were done on the weekend (Saturday Mar 29 and Sunday Apr 6), and we are grateful to those willing to work a seven-day week during burn season! Not included in the above summary is the burn at Black Earth Rettenmund Prairie State Natural Area, which Amanda and Kathie also managed. That burn was done on Saturday, April 26 and is described in a separate post. Shooting star (Dodecatheon meadii) is one of the early flowering plants in our area. Although it is found often in high-quality prairies, at Pleasant Valley Conservancy its principal habitat is the oak savannas. We have extensive native populations in our savannas. However, before restoration they were suppressed by the deep shade. Once the offending brush and invasive trees were removed and fire was introduced, shooting stars magically appeared. For the past 12-15 years that restoration has been going on, flowering plants have appeared in each newly restored savanna area. With continued brush/tree clearing and annual fires, more shooting stars appeared. This year seems to be a banner year for shooting star in the savannas. Our savanna burn was carried out only 23 days ago and patches of small plants are being found everywhere. The photos here are from the White Oak Savanna (Unit 12A), but we are seeing them all over. Note that all of these savanna populations are native to the site. We also have seeded this species in our various planted prairies. 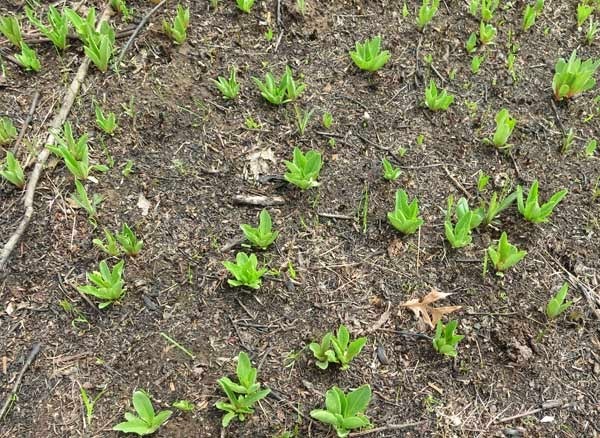 It takes about 7 years before flowering shooting star plants are seen in the seeded prairies. On the other hand, flowering populations appear in the savannas the first year after the canopy is opened.